Maybe it’s a combination of all of the above! In 1926, Miss America wore a polka dot swimsuit. That was the year America fell in love with polka dots. A few years later Disney created Minnie Mouse–who wore a red polka dot dress and matching bow–and in 1951, Marilyn Monroe solidified the trend when she wore her polka dot bikini. Ever since, polka dots have been a must have for every fashion icon’s wardrobe. Polka dots are surprisingly versatile for being such a busy print. They can go from casual everyday to weekend dressy and can be worn year-round. Yes they’re a lively statement on their own, but if you want to wear them in a more understated way, wear them as a layering piece. Put a sweater over your polka dot blouse or add a pair of polka dot pumps. It’s an unexpected little reveal of the enchanting dots. If you want to go a little bolder, you can mix and match polka dot prints. I doubled up on polka dots in this outfit by adding my red shoes with polka dot bows. Polka dot fashion pieces come in all shapes and colors, but the black and white polka dot is one of my favorites. It’s a great way to put together a classic black and white look. 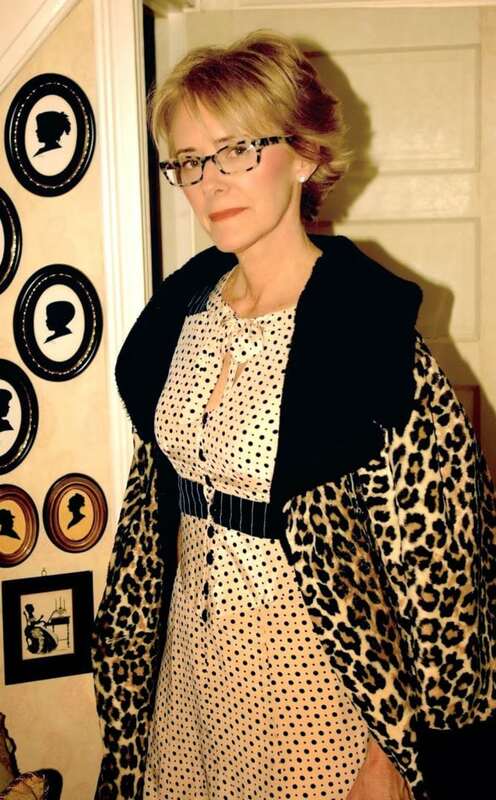 Polka dots pair well with other patterns like this leopard coat. This look works because the dress and the coat are in the same color families and because the patterns are different sizes. These sandals don’t scream polka dots because the colors all blend together, so it’s a more subtle look. 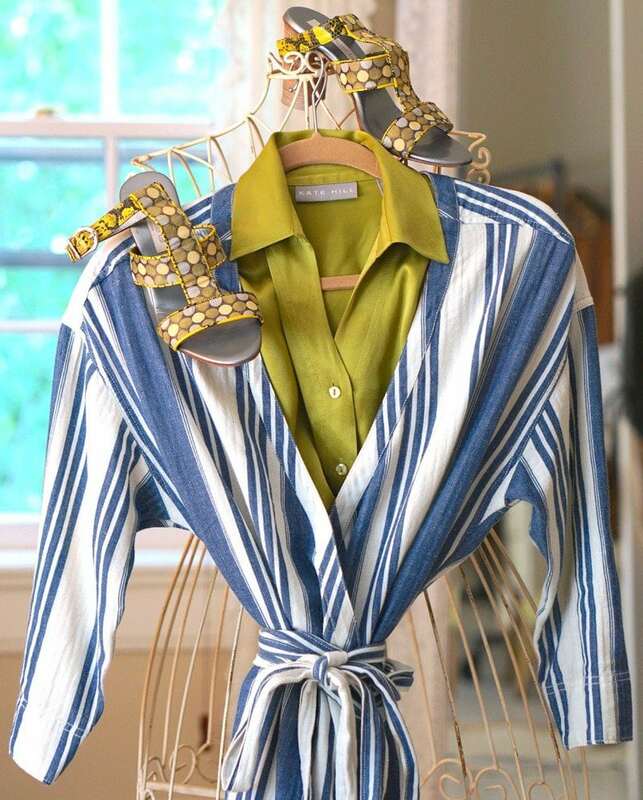 Adding them to the striped dress is a great combo. 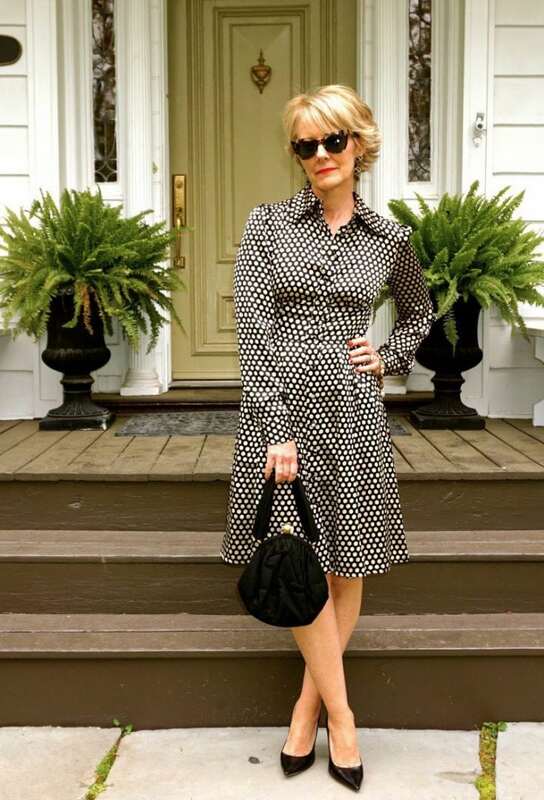 You can’t get a much more classic look than a black and cream polka dot dress. This dress doesn’t need anything else. It stands alone as a very stylish look. I’ve toned down a bright orange polka dot blouse by throwing my leopard trim jacket over it. Orange pairs with tan and leopard so well! Nothing is more flirty than a pair of polka dot slingbacks. I found these blue and white polka dot shoes at a vintage store, and when I wear them, people always want to know where I got them! 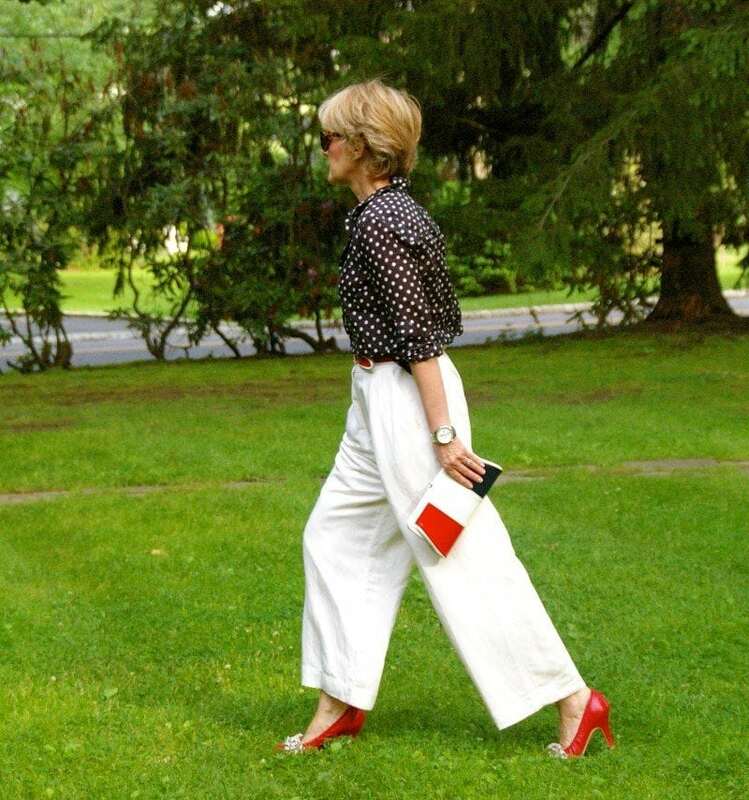 This outfit is an example of how to wear two very different polka dot prints together. It works because I’ve combined a large polka dot pattern with a small one, and because both of the polka dots are brown. This is such an easy look as denim goes with anything. The denim allows the polka dot palazzo pant to be the statement piece. Don’t shy away from the dot! Some people feel that polka dots are tricky to wear, but they really aren’t. It’s a timeless print, and they’re a great way to add a refresing twist to your wardrobe. So if you want to liven things up a bit, Rock the Dot! Yes, definitely flirty! Never too old. Very nice. Love this one. Thank you Marianne, I had a great time putting this post together! 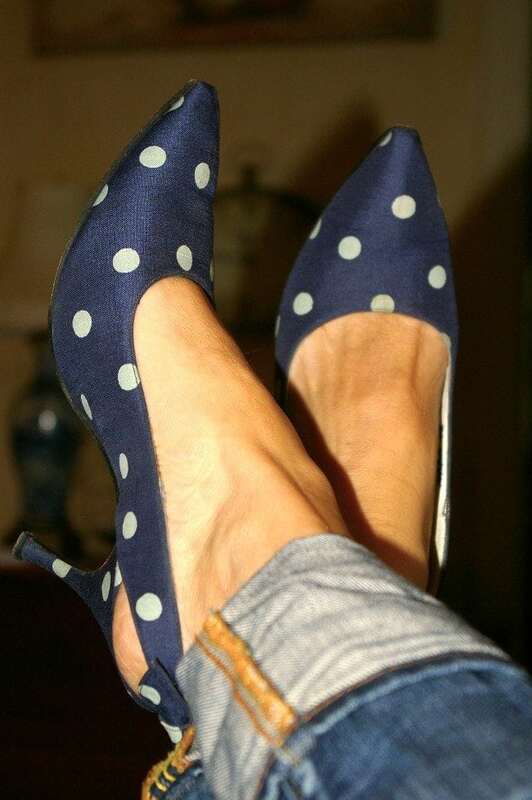 Great post Cherie – and I love, love, love the navy polka dot shoes! 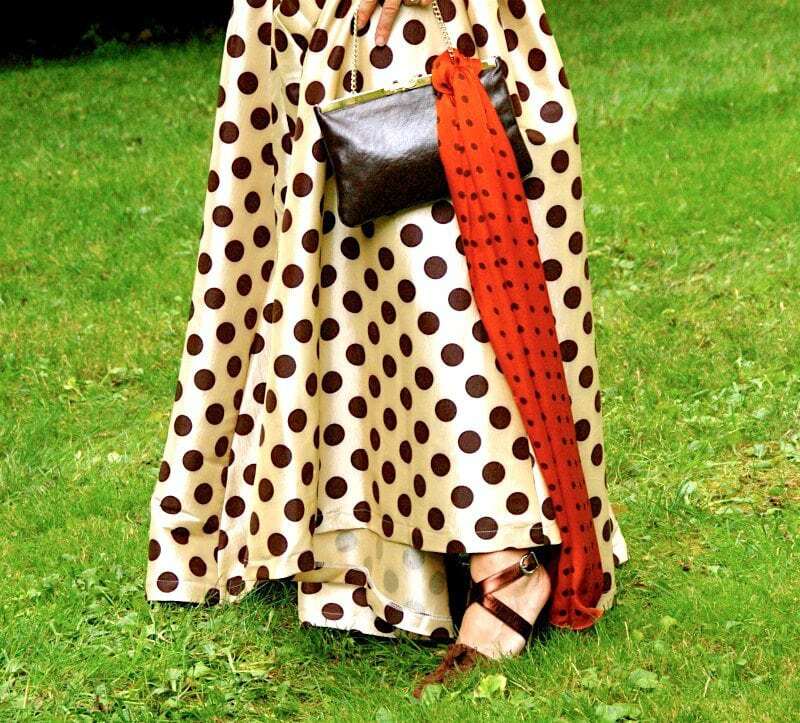 I only have that SKIRT you have in beige and dark brown.That is it for my polka dot collection! I don’t know WHY I have always shied away from them……………perhaps because I am a LARGE WOMAN! 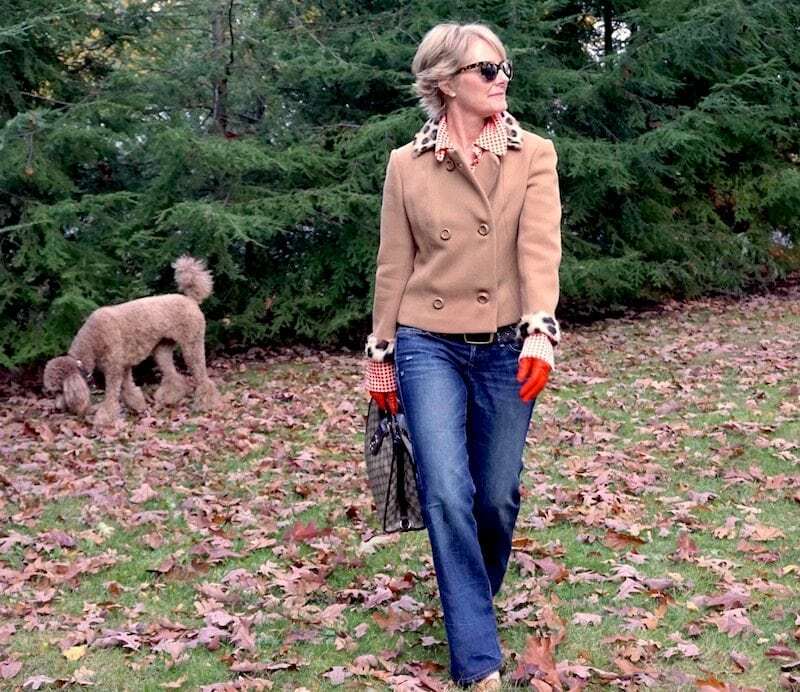 YOU have been BUSY!Thrilled to see on INSTAGRAM you were also FEATURED HERE TODAY………..if anyone NEDDS MORE OF CHERie’s LOOK HOP over to THE VINTAGE CONTESSA.NET as I featured her as well in the AGELESS STYLE SERIES I DO with CINDY HATTERSLEY of ROUGH LUXE LIFESTYLE! NOW can we get a PHOTO of YOU with ALL THREE DOGS?IS that a POSSIBILITY or NOT? BRENDA SAFE TRAVELS……..and DO GIVE BACI to ITALY FOR ME.I never wanted to LEAVE!!!!!!!!!! Looking for a bathing suit. Of course black. Makes me slimmer right? Well, found a black with white polka dots. Tried it on. Might as well. Son of a gun, it made me slimmer than the black. Something about the eyes being so busy looking at the polka dots they slim you down. So right on Cherie! I think you are absolutely right Sandra, and a polka dot bathing suit is much more interesting right? I have all black bathing suits, so I think next summer I will be following in your footsteps and looking for a polka dot one. Thank you Sandra!! Why thank you so much Gloria!